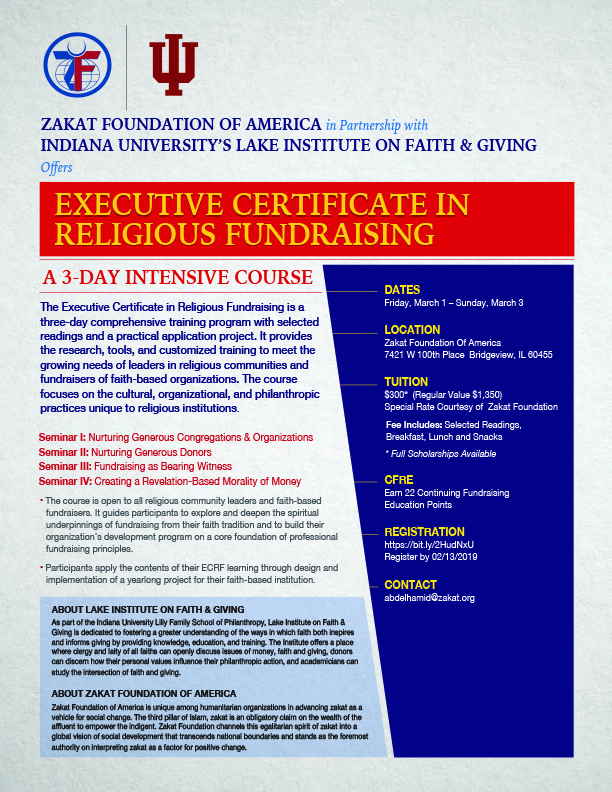 Zakat Foundation of America, in partnership with Indiana University’s Lake Institute on Faith and Giving, is offering a three-day intensive course on religious fundraising. This four-part course will earn those who complete it an Executive Certificate in Religious Fundraising. It provides the research, tools and customized training needed to meet religious community leaders’ needs as well as the needs associated with faith-based organization fundraising. The course, which lasts from Friday, March 1, to Sunday, March 3, will be held at Zakat Foundation of America’s Bridgeview, Illinois, office and include selected readings, breakfast, lunch, and snacks.The course is offered at a special rate of $300 (regular value is $1,350), courtesy of Zakat Foundation of America as a service and gift to community leaders and organizations looking to enhance capacity building. Full scholarships are available. Click here for a PDF of the flyer.